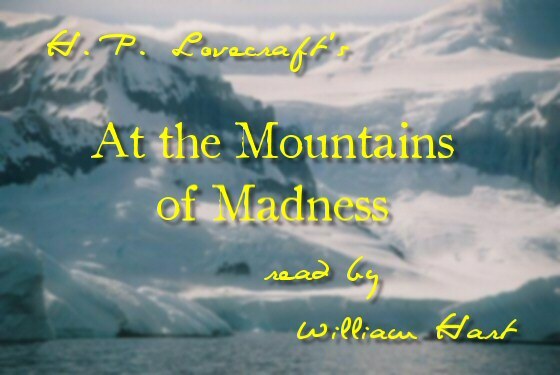 ← H. P. Lovecraft’s, “At the Mountains of Madness” Chapter 08 Read By William Hart Is Now On YouTube! Over the next few weeks, I’ll be posting all twelve chapters of H. P. Lovecraft’s, “At the Mountains of Madness,” one chapter at a time, to stretch out the fun; and to give me time to clean each chapter up a bit (and correct the bloopers also) before they are posted here. I’m also taking a little time between each posting to allow for any feedback, to see if there is an interest in my posting the entire reading. Nine chapters (roughly 81%) down, with three more (roughly 19%) to go, one-at-a-time, until we reach The End. NOTE: If you do a normal click on the MP3 file link in this post, WordPress will play it for you. If you’d like to download and save the file for yourself, and you are using a PC, right-click, to bring up the right-click menu and use the “Save Link As” function to save the MP3 file to your hard drive. If you’d like to download and save the file for yourself, and you are using a Mac, I believe that would be ctrl + Click to bring up the right click menu, and use the “Download Linked File” function to save the MP3 file to your hard drive. I don’t own a Mac so please correct me if I am wrong! Please let me know if this reading is to your liking by way of comments. And please tell me if you do want more of this tale sooner, rather than later. Chapter Ten is coming soon, but I can’t predict the date. Hang on for more! I just wish I had a sound-proofed studio; or far more control over the dogs, cats, people, cars, trucks, airplanes, helicopters, horns, music, auto-repair, telephone, radio, alarms, plumbing, television, coughing, and stomach noises than I do. I’m even starting to believe that the local dogs howl at all of the airplanes too. As soon as I get one interrupting a recording session, there will always be a second one right behind them; followed by a series of dogs howling and barking at each other! Oh well. I’m getting them out as fast as I can! This entry was posted in 1920's, 1930's, 3D, At the Mountains of Madness, Audio, Audio Book, Audiobook, Book, Books, Elder Ones, Fiction, Free, Guillermo del Toro, H. P. Lovecraft, H. P. Lovecraft Updates, James Cameron, MP3 Files, Mythos, Old Ones, Readings, Universal Studios, William (Will) Hart and tagged 1920's, 1930's, 3D, At The Mountains of Madness, Audio Book, Audiobook, Book, Books, Cameron, del Toro, Elder Ones, Fiction, Free, Guillermo, Guillermo del Toro, H. P. Lovecraft, Hart, James, James Cameron, Lovecraft, MP3, Mythos, Old Ones, Readings, Studios, Universal, William, William Hart. Bookmark the permalink.